Celebrating from preschool through high school. A party offers a great way to celebrate a graduate’s achievement with family and friends. Here are some ideas to help you host a party with lots of pomp and circumstance, whether your student is graduating from preschool, kindergarten or high school. Make graduation cap invitations from black card stock tied with a tassel and write the party details in silver ink. Or, make personalized mock report cards with information about the shindig in place of grades. If you’re celebrating a little one’s graduation, use lots of colored block letters on which to inform guests about the party. Also consider involving the guest of honor by having your child decorate the invitations with crayons. For a high school graduate, including before and after pictures of your teen is a creative way to show a student’s physical progression from birth to the teenage years. Use school photos to adorn the party scene. Enlarge one fabulous recent photo to display under a “Class of 2011” banner. For added fun, have guests autograph the banner, or another object, and write words of advice for a prosperous future. You can also embellish the party space in the graduate’s school colors. Position flowers and balloon clusters on party tables and in other prominent places in the room. 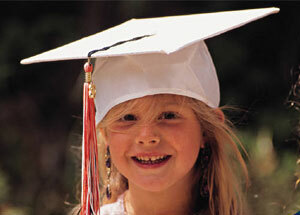 To honor the graduate, encourage guests to assist in making a memory book. Have a table with craft materials. For young celebrants, ask guests to decorate a page with a drawing that illustrates a memory involving the young graduate. Ask older celebrants to write down a favorite memory and perhaps decorate the page. On the party invitations, prompt guests to bring photos and keepsakes from previous years to include in the book. Take photos at the party to capture all of the newly created memories. When it comes to planning the menu, have fun by giving each dish a name that fits the school theme. Ideas for dishes include School Fuel, Honor Rolls, Biology Broccoli, Kindergarten Paste Pasta and Brownie-nosers. Consider using plates, cups and napkins in the graduate’s school colors. For older celebrants, create fortune balloons. To do this, write predictions and words of wisdom on slips of paper before inserting them in the balloons and inflating. Give the fortune balloons to guests, summoning them to pop the balloons to read their fortunes. Ideas for children’s favors at graduation parties include sticker sheets of gold stars, colored pencils, graduation cap bookmarks and edible favors with the school’s logo. The sky is the limit— for the party and your rising star.